Mattel Synsonics Kit, Synthesizer Sample from Francis Prève. Francis Prève has released a free Mattel Synsonics Kit sound library for Ableton Live. In Francis Prève's own words: "Unlike the more insectile sounds coming from the Roland and Korg boxes of the same era, the sound of the Synsonics was vaguely reminiscent of the Simmons SDS-V or Pollard Syndrum. The toms had an aggressive vibe that few products from that time could match – and the cymbals were glorious blasts of white noise." "About a month ago, I pulled my Synsonics of its shelf in my studio, fired it up and started sampling. The results are in this Live 7 compatible Drum Rack." 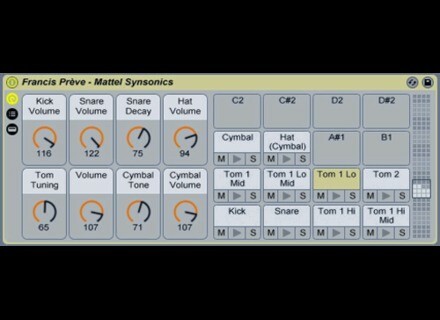 The Mattel Synsonics Kit for Ableton is available to download at no cost. Sample Logic Rumble Sample Logic and System Blue have joined forces to release Rumble - a Kontakt Player virtual instrument that combines traditional marching drums with cinematic sound design.